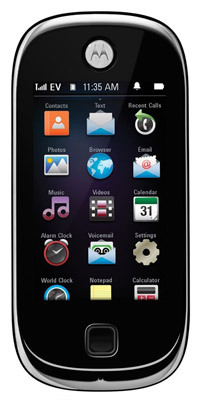 Motorola today introduced the QA4 Evoke CDMA handset, Motorola's newest handset targeted to social-networking fans. The last time we talked about this touchscreen slider phone was back in February when it was approved by the FCC. Features of the QA4 include 2.8-inch WQVGA (240×400 pixels) touchscreen display, a 2 megapixel camera with 5x digital zoom and 256MB internal memory with a microSD card slot for extra storage. Price and carriers were not revealed yet, but Motorola is expecting to launch the QA4 Evoke in the second quarter of 2009.
this is how motorola is trying to get away from the razr line into something else new and fresh? this is the slider version of the iphone. moto, be creative! stop giving us clones.